The crowd listens as the Hingham Advisory Committee ask questions of Aquarion executives; The shovel used to break ground for the original Hingham Water Co. in 1879. Back in the late 1870s, residents of Hingham voted four times against starting a municipal water company — balking at the then staggering $131,000 investment — so a dozen prominent local citizens pooled their resources and formed the private Hingham Water Co. instead. At this spring’s Town Meeting on April 22, Hingham residents will decide whether to buy that private utility — now owned by Aquarion Water, a subsidiary of the regional energy company Eversource — for $108 million. If approved, the purchase would bring Hingham into line with most other communities in the state, which overwhelmingly have public water systems. But Hingham also would become the only municipality in Massachusetts that owns the entire water system of another town, according to the Massachusetts Water Works Association. That’s because the water pipes of the Hingham utility extend throughout Hull, as well as a portion of Cohasset. The quirk of history — the state Legislature allowed the Hingham Water Co. to go into Hull and Cohasset in 1881 — is one detail of a complex transaction that, also by state law, requires a two-thirds Hingham Town Meeting approval. The impending vote has this affluent coastal town of 22,000 awash with competing information and opinions. Two grass-roots organizations — Citizens for Hingham Water and Keep Aquarion — are flooding the Internet with their pitches for and against the plan, which calls for Hingham’s three selectmen to become the water commissioners and set water rates and policies. The state Department of Public Utilities currently approves Aquarion’s rates and policies. Hingham’s selectmen describe their deal — which involves borrowing $112 million altogether to include associated expenses — as a cost-saving way to take control of a valuable local resource, claiming it will save consumers $50 million over the next 31 years. Aquarion officials — who are fighting what they see as a hostile takeover — challenge those numbers. They say the town will spend closer to $250 million and the deal will cost ratepayers $12 million over 31 years. Both sides are pushing their versions of the deal in increasingly testy exchanges. “I’m not surprised, with a decision of such magnitude,” said Domenic Sestito, chairman of the Hull Board of Selectman. While neither Hull nor Cohasset have taken a position on the proposed takeover, officials in both communities have been supportive. Hingham has been here before. In 1871, the town looked at supplementing individual wells with water from Accord Pond in the south of town and, four years later, got state permission to create a public water system. 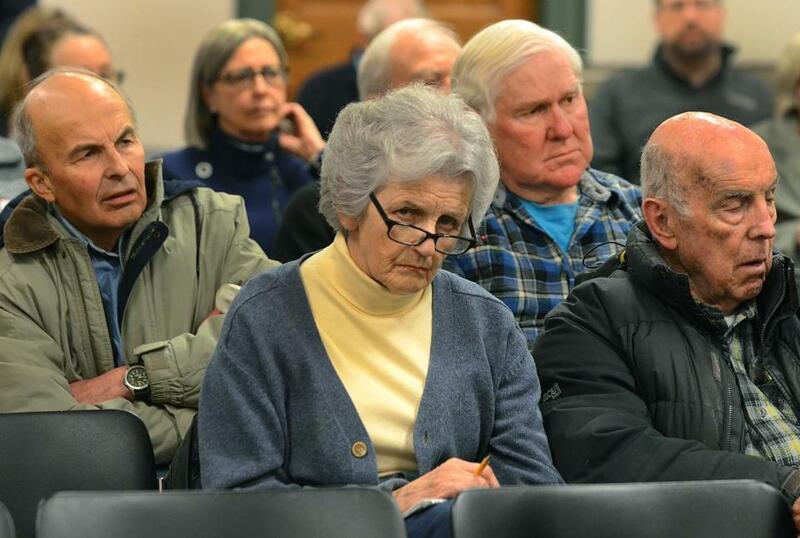 But the idea was quashed locally — by increasingly wide margins — at four subsequent Town Meetings. The legislation specifically allowed the town of Hingham to buy the utility in the future, and provided a formula for calculating the cost. And in 1881, the state allowed the water company to extend into Hull and North Cohasset. In the 1930s, Hingham looked into exercising its purchase option, and tried to get the formula changed to lower the price. The state Supreme Judicial Court rejected the maneuver, and the plan died, as it did again in the late 1950s. “It seems to be that our financial picture is such today that we would be in no position to even consider such an undertaking,” the Hingham Journal editorialized at the time, noting other pressing financial needs such as new schools. In 1985, the town again considered buying the water company. The cost was estimated at $6.1 million, with another $20 million required to build a new water treatment plant. Cathy Salisbury chaired the town’s Water Supply Committee then and is now active in the anti-purchase Keep Aquarion group. She points to the uncertainty of the operating cost and the potential for large unanticipated expenses in the future with 192 miles of aging pipes — especially in Hull. Then there’s politicization of water rates and policy, and the relatively small amount of savings for individual ratepayers, she said. Hingham Selectwoman Mary Power said the impetus for the proposed purchase — initiated in 2012 — was dissatisfaction with high water rates and service disruptions, and the belief that the town could do the job for less money, primarily because it didn’t have to provide profits to shareholders. But the key point is control, she said.